ATS Euromaster has opened a new dedicated hub centre, expanding mobile tyre maintenance support for quarrying, mining, ports and industrial operators across Yorkshire and the North East. Based in Redcar, the ATS Euromaster hub provides a specialist central headquarters for a mobile service fleet for heavy vehicles, supporting operators with tyre and vehicle maintenance at their own sites ranging from Sheffield to Teesside. The hub has been developed in response to substantial new contract acquisitions in the earthmover and industrial sectors across the North East. 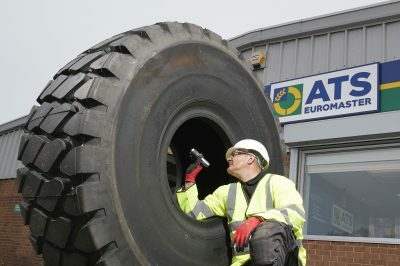 ATS Euromaster is now managing tyres for businesses providing steel reclamation work in the North East, and earthmover operators along the Yorkshire coast. The Redcar hub provides a base for a mobile service fleet that can handle some of the largest tyres in the earthmover sector, with the capability to safely transport, unload and position tyres with rims of up to 51”. ATS Euromaster’s expert technicians can also provide onsite support for large machines in places such as pits and quarries where accessibility can be challenging. Technicians from Redcar have undergone advanced training to ensure they can offer expert advice on tyre choice and outstanding customer care for businesses operating big machines in some of the toughest off-road conditions. We are now working with several major customers in the North East with highly specialised industrial tyre requirements. With this new mobile service hub, we can provide them with outstanding service on their own sites at a time to suit them.